For the most part, whatever I heard previously about Iran, has proved untrue. It’s a beautiful country with very generous and kindhearted people who’ve paid for petrol, done repairs for free, given me small donations, cups of tea, and lots of warm smiles. Between the populated areas there’s mainly desert, but each city is a green oasis with gardens, trees and lovely parks. The architecture, bazaars and places to visit are fascinating. I spent a few nights in Yazd and met up with Roemer & Lisan a couple riding from the Netherlands. We walked the town for 4 hours in the search for a local icecream shop. I wanted to try rosewater icecream but either I couldn’t make myself understood or rosewater was off the menu because that’s not what we ended up with. It was really great to chat to another couple about their adventure and compare notes. There wasn’t a great deal to stay longer for so on Thurs 26th we parted company with me heading west and Lisan & Roemer riding to Pakistan. From Yazd I had a reasonably good run until 80 kms before Nain on the way to Isfahan. Then, another blowout. The back tyre sidewall collapsed causing the bike to weave all over the road. Each time this has happened I’ve been lucky I didn’t end up in the path of oncoming traffic. 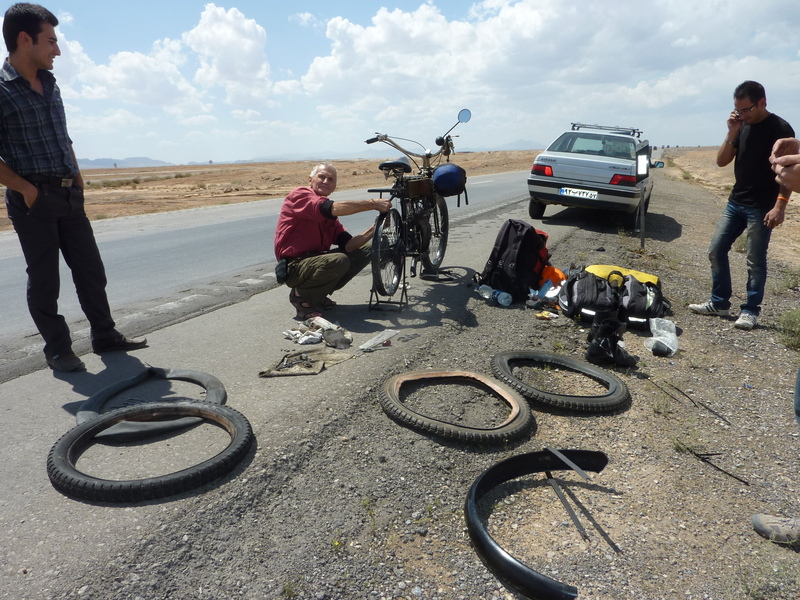 As a result seven spokes were broken and it took 3 hours to replace the tyre, true up the wheel and replace the spokes. On the front wheel is a 30 year old tyre still hanging in there. Because it is very light in the front there is no pressure on it like the back wheel. I managed to get 3500 kms out of the back tyre this time, more than I’d expected, so I can’t complain. Too tired and too late to continue I spent the night sleeping in a concrete drain. Not the most comfortable of places but sheltered and when you’re knackered I find you can sleep just about anywhere. At 2,200 metres it was pretty cold and I was grateful for a warm sleeping bag and mattress. Next morning after seeing oil on the ground a closer inspection revealed a broken oil pipe to the engine. Only 11 kms into Toudeshk and Mohammed Jalali opened up his shop to make me a new pipe – all as good as new in no time, and he wouldn’t accept payment. Mohammad runs the Tak –Taku Homestay, a legendary place when it comes to accommodation. Mohammad was a fantastic host and guide, giving me a great insight into the area and village life. By May 1st I’d reached Isfahan, a city I really enjoyed. It’s attractively laid out with tree-lined boulevards, numerous parks, gardens and bridges, national monuments, mosques and interesting architecture. At the Amir Kabir Hostel I met up with Laura & Adrian from Romania, a nice young couple who passed on some good information about their country. That’s the great thing about meeting other travellers along the way – you get the best information firsthand. I’d heard Kashan was worth visiting but when I arrived there were thousands of visitors in town for a festival and there was no accommodation available. Everywhere was a sea of people filled with campers, including the road edges, parks, in fact anywhere there was a space big enough to lay down. One night was about all I could cope with and I moved on to about 50 kms outside Tehran hoping to sit it out for a few days before Lynne arrived from Pakistan. It gets tiring camping in open spaces where passersby always want to talk, so when I found a private spot behind a supermarket away from view I thought I could remain there undisturbed. Unfortunately I’d been noticed. While I was in the supermarket only a few metres away, the tent was slashed, and the majority of my gear stolen, including spare parts, panniers, petrol containers, backpack and other essentials, including some hidden cash. It’s never a good feeling to be taken advantage of, and being robbed is particularly nasty. I guess I’d let my guard down after so many positive experiences over the past few months. Twelve hours in police stations being shunted between one place to another didn’t do anything to how I was feeling and the outcome didn’t prove worth all the hassle. And, much of what was taken isn’t of any use to anyone. It is unlikely that any of my stuff will be recovered so it’s time to move on. As unpleasant and inconvenient as it’s been, the reality is that I’m okay and the bike’s fine. I plan to enjoy the rest of the journey despite this setback. If there’s any lingering concern it is only that I now have no bike spares, so fingers crossed there won’t be a need for them any time soon. Nice to hear from you. I remember your great hamburgers and your kindness to me. I thought you already spoke English well, but good you learning more. Please say ‘Hi’ to the lady in the apartment next door who with her family brought me a nice bowl of fruit. Hi Ron!where are you these days?! I’m in Sofia, Bulgaria at the moment. I’ll be here for a few days then head slowly north to Romania for a bike rally which should be fun. Life’s good, I’m fit and healthy and the bike is going well. I caught up with Hayashi in Istanbul and he is going well with his plan to get to Europe then back across Russia. How about you – how are you doing? Email me so i can catch up with your news. We are making a trip from the UK to Nepal, currently in Istanbul where we understand you are somewhere around. Thanks for your good wishes. I’m now heading off towards Bulgaria. Looking forward to a good ride. All the best for your journey – it gets more interesting (and challenging) the further east you go. Have fun. Hang in there! We only knew what you have accomplished till we crossed into Pakistan and India after we met. We kept telling each other in various situations, “How has Ron managed in heaven’s name?” And you did. Look back at what you’ve done and you will reach your goals on eagles’ wings. We are sure. Deep admiration from us here (in Nepal now). Hey Roemer & Lisan, great to hear from you both and to know you made it safely to Nepal – good for you! LOL I know what you mean, I sometimes wonder too how I made it this far. Honestly though, Nepal wasn’t near as hard as Turkey in terms of climbing. I pushed for 5 kms one day this week. Insane I know, but sometimes necessary. Keep enjoying yourselves and thanks for the encouragement and your friendship. Hope we meet again. Yes, a bit of a bugger. Lost a few momentos including a lovely embroidered Pakistan cap given to me as a gift. Still, the memories can’t be stolen. Hi Paul Louis. Yes, the pistons I made and other spares all gone. Hopefully I won’t need them and if I do then I will find access to equipment to make what I need. All is behind me and it’s onward now. Good to hear your Excelsior is coming together well. I can imagine that feels very satisfying. Good luck with the remainder of the restoration. Not letting the bad stuff get me down. Seems a long time ago since Pak Wheels with many more great experiences ahead. Its hard to believe, I am sure you don’t look like a wealthy western tourist!! so it defies the imagination why they would take stuff that realy has no use to them, you and Effie will have to suffer this loss untill you can replace some of your gear, lets hope Tehran has what you need. You’re right, I look like a skinny old nutcase most of the time! LOL Did have some cash stashed away so if they find that I’m sure they’ll have a party. Put it down to experience. Friends are helping replace what I can’t find here so all is well. Effie resting now Lynne has arrived. I can almost hear the bike sigh with relief. I am very sorry for that.if you need any thing or help please inform me. Thank you for your kind offer to help. All is well. Great getting to see Lynne again. She says “Hi” to you and your family. Tehran is huge and lots to see and do before we head towards Turkey in a week or two. Hoping to see you in Australia one of these days. Any wife prospects been passing through lately?? Will recommend all the beautiful girls I meet come your way – I’m being very selective. As is mentioned above: you can not blame all because of a misfortune with one. Lesson is to keep allert !!! To bad for your specific spares for Effie, but as you noticed they can make everything in those countries and they still not in a disposal society, but have to keep “inventing and improvise”. Keep up the good spirit and let the stories and Effie roll. I will be more careful from here-on but these things happen when your guard is down. Managed to get most things replaced. I’d have to say Tehran is more like the west that most people would imagine. Has everything disposable and less inclined to improvise, but people very generous in helping out where they can or at least point me in the right direction. Effie taking a break til we head to Turkey – no doubt she’ll be relieved! Hope to have more images of the beautiful country uploaded soon. So sorry to hear the bad news about the theft. From everything I’ve read about Iran the crime rate is very low but I suppose it is the exceptions that prove the rule. As you say, the key thing is that you and the bike are safe. Yes, I think you’re right about the crime rate being low. Did meet a traveller the other day who had his bag snatched at a well known tourist spot the other day, but where in the world doesn’t that happen? The way I’ve been treated has more than made up for one unfortunate incident. Iran sure is a beautiful country in every way. Effie and I are good. As you say you are okay and that is the most important thing. Your patience and humour have seen you through many a situation, though this is a little hard to turn around. Thoughts and admiration are with you. “Thoughts” is good Fi. Having a week or two off the bike while Lynnie & I explore this lovely city and beyond. I imagine Effie is sighing with relief. I always get a sore tail once I get back on after a break, but I’m soon back in the rhythm. Down another notch in my belt – maybe this beautiful Persian icecream will put some fat on my bones! Head up Ron ! One bad guy out of thousand good guys. Keep on rolling, Lynne and Tehran are waiting for you. If any spares needed to be shipped, let me know. Great to meet up with Lynne. Unfortunately she’s been pretty sick but once the medication does its magic we’ll get out and see the sights together. Met your wonderful friend Mammoud – what a nice guy. Bike stored at his friend’s place for a few days while we are in Tehran – too hard to ride it in any city. No doubt we’ll be in touch. So sory about that; but as you say, you’re safe and Effie is. As true as one swallow doesn’t make spring, one bad guy don’t make the world a bad place. Keep it up, cheers. We’re still expecting you in Belgium !!! So true! What goes around comes around and I doubt the guy(s) who caused me grief will win out in the end. Persian hospitality is wonderful and I feel humbled by how many kind gestures I receive each day. I’m past halfway (I think) so doing okay. Good to be sharing the adventure with so many of you. We follow your trip with great interest. You have done some amazing things and we are sure this upset will not deter you from the rest of your adventure. Good luck and keep safe and healthy. Good to hear you’re following the blog with interest. Met up with Lynne in Tehran, good to see her after so long. Both of us crook at the moment, her with a bug she picked up in India a few months ago and me with a head cold. She’s on some pretty tough medication which is laying her low for a few days. Still, we’ll be right as rain soon and able to enjoy all the beautiful country has to offer. You’re right, I’m not letting this incident get me down – could have happened anywhere and was a good lesson to learn. Take care.